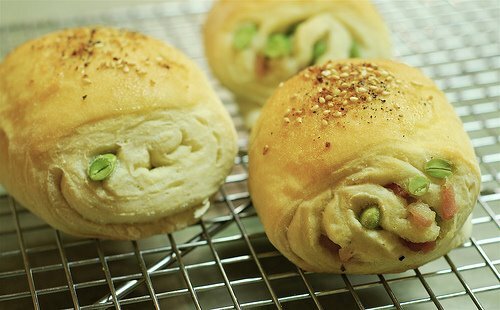 Edamame makes a delicious, nutty addition to baked goods, too! To taste: fresh chopped onion, fresh or dry basil, parmesan cheese, white sesame seeds, freshly ground black pepper, etc. (1) Prepare dough by hand or in a bread machine; the first rise should take about 60 minutes. (2) Push out the excess gas, then roll out into a large rectangle (about 14~16 inches long). (3) Spread the bacon and edamame on the dough, then roll up lengthwise; seal the ends. (4) Cut the roll into 6 equal sized pieces, put on a greased sheet, and allow to rise (second rise) for about 30 minutes. (5) Sprinkle the toppings (diced onion, parmesan cheese, sesame seeds, black pepper, etc.) on the rolls and bake at 390 degrees Fahrenheit for about 15 minutes.